This was the start of our pilgrimage, a day full of wonder and awe, a lake so peaceful and calm, a boat trip to remember for ever, a Eucharist by the shore of the lake, serene and full of the Spirit. 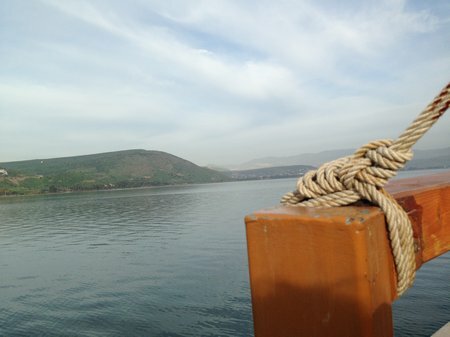 We set out, as many do, into the middle of the Sea of Galilee, peaceful and calm, we had prayers we heard the story of the fishermen and the start of the disciples calling, we saw the geography of that place where Jesus began his work. After the Bishop had said prayers, there were a few of us who started dancing, to the Jewish dance of Hava Nagila, with music from the crew. – Who would have thought it!! But as always dance was brilliant to express emotions and joy. We held Eucharist by the shores, and to my amazement,the prayers for that day were for the parish were I now serve and first came to church in Ashwicken. And towards the end of the day we renewed our baptisms in the River Jordan. A glimpse into this journey of faith, go to holylandpilgrimage on this site to find out more about the journey. This entry was posted in church seasons, community, Faith and business, Faith goes walkabout, pastoral, theological. Bookmark the permalink.